What is the state of B2B eCommerce in India? Along with regional overviews, the report also breaks down the survey responses into sub-region to show how B2B firms in ANZ, Southeast Asia, and India are developing eCommerce capabilities at different rates. Below are three points which highlight how B2B firms in India differ from their counterparts in the other parts of Asia-Pacific with respect to the implementation of eCommerce capabilities. The first question we asked survey participants was whether they had an operational B2B eCommerce website. That is, did their company’s website actually support transactions, or were they still in the planning stage? Responses from B2B marketers in India indicated that most (82%) of their B2B eCommerce websites already handled transactions. Viewing the data by sub-region, it appears that a greater share of B2B companies in India support transactions than the competition in Southeast Asia (69%) and ANZ (68%). Having transaction capabilities is one thing, but do the B2B eCommerce sites have investment and support from the business for continuous improvements? When asked whether this was the case in India, nearly all (93%) respondents from India confirmed that their organisations were ‘committed to investment in the B2B eCommerce experience’. 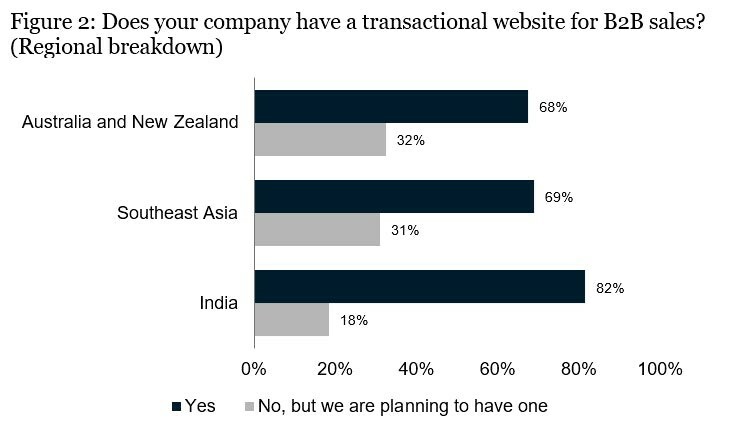 This percentage was greater than ANZ (70%) and Southeast Asia (75%) which suggests that B2B companies in India are the most likely in the region to be providing ongoing, material support for improving the B2B eCommerce experience. With eCommerce sites up and running and commitment from their organisations to fund continuous improvement, B2B marketers in India are certainly thinking about what to tackle next. To find out about their top priorities, we asked respondents to tell us what they saw as ‘the most exciting technology-related trend for B2B eCommerce’. Nearly half (47%) of respondents from India indicated that one of two technologies were the most exciting for B2B eCommerce. At the top of the list was the ‘Internet of Things’ (24%) which reflects the hope that connected equipment and vehicles can offer benefits like more visibility across the supply chain and inventory efficiencies. A close second was ‘Artificial intelligence/machine learning (including chatbots)’ with 23% of B2B marketers indicating that they are excited about the power of learning technology and its potential to help them scale their eCommerce capabilities by automating business processes such as customer service. 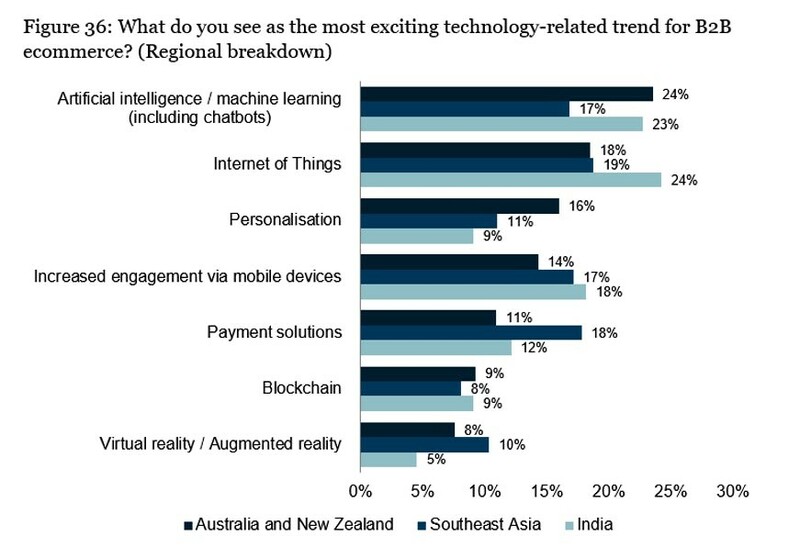 Personalisation was significantly less likely to be ‘exciting’ for B2B marketers in India (9%) as opposed to ANZ (16%) and, somewhat surprisingly, blockchain was the least likely technology trend to be chosen by marketers region-wide. For a wealth of other data and insights on the progress of B2B eCommerce in ANZ, Southeast Asia, and India, download the full report from Econsultancy in association with Magento.